This exclusive, man made 216 acre island paradise, once the winter estate of the Vanderbilt's, is now home to some of Miami's most private, upscale community. Fisher Island can only be accessed by private ferry or private yacht from the McArthur Causeway, conveniently located between Miami and Miami Beach, surrounded by the crystal waters of Biscayne Bay and the Atlantic Ocean. Homes for sale on Fisher Island feature exclusive Mediterranean style residences, an international spa, 9 hole golf course, two deep water marina's, gorgeous beach, six restaurants, club, bank, gourmet market, sea plane ramp, post office, helipad, dry cleaning, and fire and security departments to service the community. Fisher Island homes for sale are located on a variety of diverse villages including Bayside Village, Marina Village, and Bayview Village. EXPERIENCE FISHER ISLAND LIVING AT ITS FINEST IN THIS LOVELY 3RD FLOOR BAYVIEW UNIT OFFERING BREATHTAKING PANORAMIC VIEWS OF BISCAYNE BAY AND THE MIAMI DOWNTOWN SKYLINE. FEATURES INCLUDE: OVERSIZED TERRACES PERFECT FOR ENTERTAINING, 2 BEDROOMS PLUS DEN, 2.5 BATHS, 1,950 SQ. FT. INTERIOR, MARBLE FLOORS THROUGHOUT, FLOOR TO CEILING SLIDING DOORS, GREAT VIEWS FROM EVERY ROOM, WET BAR AND MANY MORE FEATURES. THE BUILDING HAS BEEN RECENTLY RENOVATED WITH NEW ELEVATORS, GARAGE, FRONT ENTRANCE, LANDSCAPING, MARBLE FLOORS IN THE COMMON AREAS, ETC... ALL ASSESSMENTS HAVE BEEN PAID IN FULL. BUYER DOES *NOT* HAVE TO PURCHASE SELLER'S EQUITY MEMBERSHIP. LIVE THE FISHER ISLAND LIFESTYLE IN THIS EXCEPTIONAL UNIT! EASY TO SHOW. This charming Seaside Villa located on Fisher Island and is the perfect pied-a'terre. A special property for any buyers portfolio. Purchase and enjoy or rent it out for short or long term rentals. The residence is light and bright and has expansive terraces. Beautiful views of the ocean. The property boast two master suites and has marble floors throughout. The best location and is steps from the pool and private beach. Please know buyer must purchase equity membership. This magnificent Marina Village 2 bedroom 2 bath corner condo on the 3rd floor overlooks the Fisher Island marina and golf course. Features include: marble floors , updated kitchens and bathrooms, window treatments, spacious living and dinning area with lots of sunlight throughout the unit. The building allows short term and long term rentals. Live the Fisher Island lifestyle in this exceptional unit! Also available to sell the studio and the 1 bedroom separately with two folio numbers. This one of a kind 3 bedroom, 4.5 bath corner unit redefines luxury living in Fisher Island's newest building Palazzo del Sol. Professionally designed and decorated the unit is offered furnished. Interior finishes such as oak wood floors, custom built-ins, private elevator, 10' ft ceilings, Boffi kitchen with Gaggeneau & Subzero appliances, Boffi master bathroom with bookmatched marble, Lualdi doors, Apure lighting, wine cellar, bar, family room, den, etc. make this an exceptional unit. The expansive wraparound terraces are perfect for entertaining with views of gov't cut, ocean, Fisher Island and the Miami skyline. Building amenities: butler-service aperitivo bar, theatre, beauty salon, massage rooms, business center, concierge, valet, etc. Live the Fisher Island in this private oasis. This is the one you have been waiting for !! Fantanstic Oceanfront G-1 with nothing but Ocean, Ocean, Ocean !! Immaculate interior, decorator designed and upgraded. Full Hurricane doors and windows. Many Designer extras. Spectacular 3 Bedroom, 3.5 Baths + Family Room ---- Ocean, Ocean everywhere !! Please call for appointment to see. Seller does not require the purchase of Fisher Island Equity Club Membership. So this residence can easily be purchased by an existing Equity Member. See Today !! This one will not last !!! IMPECCABLY DESIGNED WITH OVER $3 MILLION OF RENOVATIONS & FINELY APPOINTED FINISHES OVERLOOKING THE PERFECT SUNSET VIEWS! This gut renovation boasts the finest construction quality of all Fisher Island's Bayside Residences just completed in August 2018. Extra wide glass panels wrap the social areas embracing the Magical Sunset & Bay Views. It comes equipped with a rarely found Ernesto Meda Italian White Glass Kitchen, Miele & Sub Zero appliances; Custom Italian Wide-Planked Blonde Oak Wood Flooring; 3 Bedrooms Convert to 4; All Bathrooms in Bookmatched Silk Georgette Marble; Minotti & Custom Turri Milano Furniture; Entertaining Bar with Glass Wine Storage; Media Room; Smart House System integrating Crestron & Lutron; Japanese Water Filtration System; 2 Parking Spaces & 2 Golf Cart Spaces. Impeccably designed & decorated turnkey Palazzo Del Sol residence w/ high-end Henge & Baxter furnishings. Featuring a masterful design boasting 3, 793 SF, 3 Bedrooms, 3 Baths + Powder room, & 767 SF terrace. Private master suite features large his & hers walk-in closets, direct terrace access w/ direct views of the Atlantic, South Pointe Park, & Gov. Cut. Magnificent book-matched Carrara marble master bath w/ walk-in rain shower, stand-alone soaking tub, his & her sinks. Further highlights include Gaggenau, SubZero, Dornbracht & Duravit appliances & fixtures. Lualdi doors, Crestron smart home + Linear Air Diffusers, & wide plank European oak wood flooring + custom living/dining separation.Equity membership purchase not required. Beautiful 3 bedrooms, 3 bathrooms plus powder room, spacious unit in Fisher's Island newest luxury building, Palazzo Del Sol. LOWEST PRICED UNIT IN THE BUILDING. B East model, 3793.sq.fWood floors, private elevator entry.Incredible, unobstructed views of the ocean and bay.Luxury living at it's best, six star multilingual full-service concierge, fitness center and cardio room designed by Wright Fit, state of the art movie theater, private massage rooms, hair and makeup salo, business center, Enzo-Enea-designed landscaped gardens and walkways, heated pool and spa. Underground parking for vehicles and golf cars. Electric car charging stations. Located in Fisher Island most desirable full concierge building, this magnificent 3 Bedroom plus den, 3.5 bath unit boasts ultra-luxurious finishes and dcor. Breathtaking SOBE views.Watch spectacular sunrises from expansive terrace. Modern gourmet kitchen offers MIELE appliances, marble floors and Baccarat lighting throughout. Master suite with elegant built -in closets. Ample bedrooms with en-suite baths and private decks. Large private storage unit, one golf cart and golf cart space. This magnificent ocean direct 3 bedroom, 3.5 bath unit redefines luxury living in one of Fisher Island's premiere building on oceanside. The unit has been completely renovated and professionally designed & decorated. It showcases: Italian wood floors, custom built-ins, a state of the art kitchen with top of the line appliances perfect for entertaining, an opened & closed kitchen, impact glass doors, automated smart home system, electrical window treatments, bedrooms with private terraces, east & west views of the Ocean, Fisher Island and Government Cut, located in the center stack of the building and many more features make this an exceptional unit. Live the Fisher Island in this elegant private oasis with custom accents. The furniture can be bought separately. Easy to show! This spectacular residence in Villa Del Mare features an expansive 2,000 SF wrap-around terrace & unobstructed city, Govt. Cut, Ocean & sunrise views. This home sports fine marble floors boasting 4,590 SF of spacious living/dining areas & family room all w/stunning ocean views. Chefs kitchen w/granite center island & eat-in seating, top the line appliances & separate breakfast area. The master suite features terrace access w/ city & ocean views & separate his & her master baths. His master bath w/walk-in closet, glass/marble rain shower & hers master bath w/walk-in closet & spa tub. The other 2 bedrooms are each spacious w/ full en-suite baths. The wrap-around terrace made to entertain & relax while enjoying Government Cut & sunrises over views the Ocean complete this amazing unit. This stunning 3BR/3.5BA, condo on Fisher Island offers spectacular views to the ocean, beach and government cut. The unit boasts 3,134 SF with open floor plan of living and dining area, limestone floors, large chef's kitchen/top of the line appliances, and separate breakfast area. The apt features large master suite with beautiful ocean view terrace access, his/hers walk-in closets, en-suite bath with Sunken Jacuzzi tub. All bedrooms feature access to terrace, Italian oak wood flooring and electric blinds. A spectacular terrace completes this home with amazing unobstructed ocean views! Breathtaking direct ocean views from this spectacular spacious 3 bedrooms 4.5 bathrooms residence at exclusive Fisher Island. Views of the ocean, beach and Downtown Miami create living works of art in nearly every room and the expansive over 1.500 sqft wraparoud balcony. Sleek and open formal living room, dinning area with marble-top bar. Polished marble floors throughout, generous sized gourmet kitchen w/ white wood cabinetry, center island with wine cooler, granite countertops, gaggeneau and subzero appliances. Breakfast area off the kitchen with downtown views. The design incl. home-wide custom built-ins along w/fine detailing and unique fixtures. The open floor plan allows a natural flow and air throughout the home. Spacious grand master suite with double doors, large. Located on America's wealthiest island, this sun-drenched villa overlooking the marina conjures up visions of Portofino in the summer. Unique features include a 14' wood beam vaulted ceiling, 5 generously sized terraces & a romantic spa tub off of the master suite. Featuring 2,744 interior sq ft, this 3 bedroom, 3.5 bath home offers captivating views, a wood-burning fireplace & a coveted location near Town Center. Ready for the new buyer's magic touch to create their own masterpiece! Fisher Island is the most secure & exclusive community in the country & includes a 1-mile long private beach, vibrant beach club, 8 dining venues, historic Vanderbilt Mansion, 18 tennis courts, golf course, 2 marinas with over 120 slips, private school & a 24,000 sq ft spa. Residence delivered unfurnished. Stunning directs views to the beach the Atlantic Ocean and Downtown Miami from this oustanding 5th flr 3BR/3+1BA oceanfront residence.Features +/- 3140 SF, Spacious layout with oversized living room and dining area w/ expansive wrap-around terrace.Chef's kitchen w/top appliances & adj private eat-in dining area.Master suite with balcony and walk-in closets. 3 well located assigned parking spaces.The building also had a $6M renovation, replacing elevators, and garage/commons.Don't miss the opportunity of being part of fishers islands lifestyle! Oceanside and its direct beachfront living and access is better located than the new residences on the international causeway. This magnificent Bayside Village 3 bedroom, 2.5 bath unit redefines luxury living at it's finest in one of Fisher Island's most desired line overlooking the Miami Downtown skyline, Ocean and Biscayne Bay. The unit has been completely renovated. It showcases: Honduran mahogany wood floors, moldings, front door, library and master bedroom doors, marble & tile floors in bathrooms, custom built wine rack with wine cooler, a state of the art kitchen with top of the line appliances, warming drawers, 2 porcelain sinks, carrara marble backsplash, granite counter tops, center island with storage cabinet beneath, impact glass doors, electric shades, all bedrooms with terraces and great views and many more features make this an exceptional unit. Live the Fisher Island in this elegant private oasis! 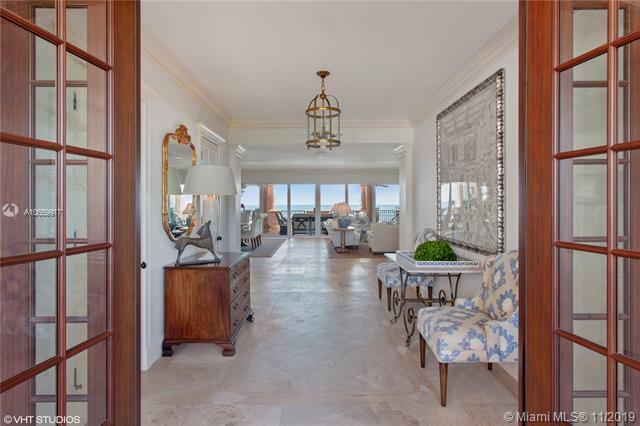 This beautiful 3BR/3+1BA Oceanside residence boasts 2,530 SF w/exquisite Travertine floors both inside & on the full wrapping balcony with spectacular sunrise views over the beach, Ocean & Government Cut. An open floor plan features a gracious living room w/direct balcony access, gourmet kitchen with granite counter tops, & separate dining area, all with amazing ocean views. The Oceanside master suite has balcony access, & master bath w/large walk-in closet, glass shower & sunken Jacuzzi tub. The other two bedrooms are each uniquely designed & one has a private balcony with views to the golf course & Downtown Miami. An expansive wrapping terrace with comfortable seating areas, al fresco dining table and open views to the beach, ocean and Government Cut complete this beautiful unit. This magnificent 3 bedroom, 3.5 bath Bayview unit redefines luxury living at it's finest. The unit has been completely renovated and professionally designed & decorated. It showcases: Italian wood floors, custom built-ins, a state of the art kitchen with top of the line appliances, impact glass doors, electrical window treatments, wet bar, leather wall panels throughout, Italian doors, renovated bathrooms, corner unit, private elevator and expansive terraces with breathtaking panoramic views of the Miami downtown skyline and Biscayne Bay. The building has been newly renovated. Buyer does not have to purchase Seller's Equity Membership. Live the Fisher Island in this elegant private oasis with custom accents. Easy to show! This magnificent 3 bedroom, 3 bath Bayside unit completely renovated redefines luxury living at it's finest. It showcases: 2,234 sq ft interior, marble floors, custom built-ins, a state of the art kitchen with top of the line appliances, renovated bathrooms, impact glass doors, expansive terrace overlooking Miami Downtown, Virginia Key and Biscayne Bay. Live the Fisher Island in this elegant private oasis! First floor bayside unit overlooking the bay and Miami skyline. Oversized covered courtyard entry. LAST UNFURNISHED 4 BEDROOM ON EAST SIDE OF PALAZZO DEL SOL!!! Spacious 4,956 SF C East4 Bed/4.5 Bath Floor-Thru floorplan is the Last in building. Spectacular Direct Ocean, Bay & South Beach Views from High Floor. Beautiful Wide-plank European Oak Wood Flooring throughout, Wraparound Terrace w/Flooring, Private Elevator entry, 10' ceilings, Boffi Kitchen w/Gaggenau & SubZero appliances, Boffi Master Bath w/BookMatched Statuaria Marble+soaking tub. Lualdi interior Doors. Porsche Design Apure Lighting. Nest Thermostat+Linear Air Diffusers. 2 Parking Spaces +Garia Golf Cart w/space. Building Amenities & Services: Butler-Serviced Aperitivo Bar & Lounge, Theatre, Hair/Makeup Salon, Private Massage Rooms, Business Center, Gym+Cardio Room, Kidville Playroom, Concierge, Zero-Edge Pool & Spa. This ground floor Southwest corner unit sits on Fisher Islands most coveted location w/unobstructed Miami skyline sunset views & views to Biscayne Bay & Atlantic Ocean. Features an expansive 2,000 SF wraparound terrace with total privacy. Feels like you are living in a private residence. Spacious open living room w/fireplace & fine Travertine marble floors throughout, family room, private dining area, gourmet kitchen w/Carrera marble center island/backsplash & separate breakfast area. The private master suite features a large office space, fireplace, terrace access & stunning custom designed master bath w/extraordinary closets spaces, Carrera marble shower & cast iron tub. The 3 other bedrooms are each spacious with en-suite bathrooms. 5-Star Fisher amenities complete this offering. WALK RIGHT INTO BREATHTAKING OCEAN VISTAS IN ONE OF THE BEST FLOORPLANS EVER DESIGNED ON FISHER ISLAND! Located in one of the Top buildings that completed full renovations of all its public spaces...this spacious 4 Bedrooms + 5.5 Baths Split Floorplan boasts Unobstructed Views of Mile-long Beach, Biscayne Bay & the Island's Golf Course. Dine & Entertain in generous exterior terraces that wrap Residence w double exposures & a Hot Tub overlooking the Beach for ideal indoor/outdoor lifestyle. Designed by Jerry Robertson w Cabochon Limestone Floors & detailed moldings in soft Cream tones. Double facing fireplace in grand living area, wet bar, huge eat-in kitchen & dining area/family room. Timeless Living Comfort Perfect for a Family! Parking for 2 cars & 1 golf cart + 1 storage space. Immaculate Bayview corner ground floor in one of the most desireable buildings.This 4/4.5 at 4560 sq ft of interior with huge wrap around terraces was meticulously redone with state of the art Porsche designed kitchen with Gaggenau appliances and equally as nice master bath . Ocean views from the east side and Miami skyline views from the south . Currently fully furnished and available for immediate occupancy. No Equity membership with this unit . Located in Fisher Islands most desirable full-service concierge building this spacious 4BR residence boasts unobstructed views of world-renowned South Beach and Government Cut from its expansive terraces & living areas. This truly impeccable condition condo is offered fully furnished and equipped. Private foyer entry with warm wood accents and wood floors throughout. Entertainment center invites w/ ample seating area. Custom cozy wine tasting room offers top of the line refrigeration for over 100 bottles. No expense spared in creating comfortable spaces to relax and enjoy the luxurious lifestyle of waterfront living in this exclusive, private resort. Rarely does a unit in this price range come on the market perfectly ready to move in, clean and uncluttered. Easy to Show! Spectacularly renovated 4 bedroom / 4 bath + powder + office, 3,580 sq. ft. Bayview unit, offering views of Biscayne Bay, Key Biscayne and downtown. Gourmet open plan kitchen, with Sub-zero and Miele appliances. Custom millwork, cabinetry and closets by Florense. Impeccably finished. Hurricane impact windows. Duravit & Graff fixtures. Wide plank, custom oak floors. Milano and Dolomite marble. Linear air diffusers. Vibia, Tom Dixon and Floss lighting. Italian custom furnishings by Gamma, Giorgetti and Baxter also available. Escape to one of the last available residences at Palazzo Del Sol, Fisher Islands newest and most lavish address. The expansive 7,630 sq. ft. home comes designer-ready and offers panoramic views of Miami Beach, Downtown Miami, and the exclusive Fisher Island golf course from its extra-deep terraces on three sides. With 5 bedrooms, 5 full baths, 2 half baths, a lavish master suite, massive living room, and private elevator entry, the residence is designed for grand living. The first true full-service building on the private island, Palazzo Del Sol offers a plethora of amenities and services for the discerning owner, including a butler-staffed aperitivo bar, fitness center, hair salon, movie theater, private cabanas, a nearby private beach, and access to the oceanfront Fisher Island Club. Impeccably designed & decorated turnkey Palazzo Del Mare 4th floor middle stack smart home residence w/high-end European furnishings and finishes. It is 5 Bedroom 5.5 Bathroom, 7,025 Interior SF & 1,370 sq. ft. of private terraces,North-East facing residence. It has a private double elevator entry, his study, children play room and TV/family room for viewing movies altogether, wide-plank European oak wood and marble flooring throughout. The Master suite has separate his and her walk-in closets, her study and luxurious Carrara marble Master suite bathroom with dual sinks, the standalone bathtub, inspired by a classical French design and large steam shower. This residence is perfect for families with children. Direct views of the Atlantic, South Pointe and Gov. Cut from your residence. This sleek and modern Oceanside unit features 4,920 SF of beautifully designed & proportioned interior space with 5 separate terraces that provide stunning Eastern Government Cut, beach & Ocean sunrise views as well as Western sunset views to the Miami skyline. Open spacious living room & dining area with direct terrace access & ocean views. Gourmet kitchen sports top of the line Gaggenau & Sub-Zero appliances & a separate breakfast area. The spacious & private master suite features his & her walk-in closets, private ocean-side terrace and marble master bath with marble/glass shower and sunken spa tub with water jets. The other 4 bedrooms are each spacious. A water car that drives on land and water, 3 assigned parking spaces and one storage unit included in sale. Unfurnished. This spectacular front row seaside villa in Fisher Island is steps away from the most exclusive beach in the world. Experience Luxury Living at its finest in this stunning one bedroom pied--terre recently renovated. Available for short & long term rental. Breathtaking beachfront views from this spacious 4th floor two bedroom rental on Fisher Island! Direct ocean views from master, living & dining rooms lets you enjoy the sounds of the ocean breeze & waves. Large split plan bedrooms make this unit the perfect all-around beach home with marble floors throughout plus more. Watch as the cruise ships glide by. Perfect for entertaining from these expansive terraces. Offered fully furnished. Available from Jan. 16, 2018 through March 31, 2019. Visit this exceptional offering! THIS IS ONE OF VERY FEW TASTEFULLY REMODELED 2 BEDROOM UNITS IN ALL OF SEASIDE. COMPLETELY REMODELED, THIS RESIDENCE OFFERS DESIGNER FINISHES AND FURNISHINGS THROUGHOUT, INCLUDING CUSTOM CLOSETS. HIGH END KITCHEN. FLAT SCREEN TV'S IN EACH ROOM. WALKING DISTANCE TO POOL AND BEACH CLUB, YOUR TROPICAL OASIS AWAITS. Beautifully renovated 2 bedroom and 2 bathroom on exclusive Fisher Island. The home features 36x36 porcelain floor, impact windows, Viking appliances, Italian custom kitchen and doors. Enjoy breathtaking views on large terrace over looking fisher island. The perfect vacation home as well as an opportunity for rental income at approximately 100k annually. Conveniently walking distance to the beach club, spa, and tennis courts. Buyer must purchase equity membership. Also, available for short term rental. Call for availability. Experience Fisher Island living in this charming Lanai ground floor Seaside Village condo with a lovely garden view. The unit is offered fully furnished and available to rent weekly,monthly, seasonal or yearly. Features include: 2 bedrooms, 2 baths, 1,429 sq ft interior, expansive wraparound terraces perfect for entertaining, marble floors throughout, new furniture, new appliances, etc. Located steps away from the sandy beach club, mansion, and tennis center. Fisher Island is private residential oasis offering unparalleled privacy and exclusivity. It's also available for sale asking $1.350M. Easy to show! Charming, two bedroom apartment available for short term lease. Please contact listing agent for availability and pricing. Cozy two bedroom apartment available for seasonal and short term leases. Please contact the listing agent to confirm availability and pricing. Amazing, spacious unit in Fisher's Island newest building, Palazzo Del SolIncredible, unobstructed views of ocean and bay.Luxury living at it's best.Fitness center, cardio room designed by Wring Fit, state of the art movie theater, pool and spa.Call or text the listing agent to show. DESIRED 3 BEDROOM 3.5 BATHROOM VILLA ON PRESTIGIOUS FISHER ISLAND AVAILABLE FOR MONTHLY OR SEASONAL RENTALS. 3 SEPARATE TERRACES. DIRECT CITY AND BAY VIEWS. WARM, MODERN, AND INVITING. THIS LUXURY PRIVATE RESIDENCE IS TASTEFULLY REMODELED. LUXURY AT IT'S FINEST WITH WOOD FLOORING THROUGHOUT, EAT-IN KITCHEN WITH BREAKFAST BAR, CUSTOM FINISHES THROUGHOUT, FULLY FURNISHED. ENJOY UNPARALLELED SUNSET VIEWS ONLY A PRIVATE ISLAND RESIDENCE CAN OFFER. Spectacular direct ocean view from this large 3 bedrooms, 4.5 bathrooms residence at the Oceanside Fisher Island. Expansive wraparound balcony with sunrise and sunset views. Large kitchen with breakfast area. Large bedrooms and his and hers marble bathroom, and walk-in closets. Motorized blackout curtains in bedrooms. Covered 2 assigned parking spaces and golf cart parking space. Pet friendly. Available immediately. THIS BEAUTIFUL FISHER ISLAND UNIT IS LOCATED ON THE FOURTH FLOOR OF SEASIDE VILLAGE WITH DIRECT OCEAN VIEWS FEATURING 2 BEDROOMS, PLUS A DEN WITH A MURPHY BED, 2 BATHS, 1,875 SQ FT INTERIOR, EXPANSIVE TERRACES, OPEN RENOVATED KITCHEN, MARBLE FLOORS THROUGHOUT, ETC. UNIT IS OFFERED FULLY FURNISHED (ARTWORK NOT INCLUDED) AND IT IS AVAILABLE FOR SHORT OR LONG TERM RENTALS, NO RENTAL RESTRICTIONS. EASY TO SHOW. LIVE THE FISHER ISLAND LIFESTYLE IN THIS EXCEPTIONAL UNIT. Experience unique luxury in South Florida, Fisher Island. this island offers exclusivity, privacy and security. One of the wealthiest zip codes in the USA. it's a ferry boat ride away from downtown Miami and minutes away from South Beach. This stunning 3 bedroom 3.5 baths, corner Bayview unit has amazing unobstructed waterfront views of the Miami skyline and breathtaking sunsets. Unit includes a golf cart. THE MOST DESIRED CORNER PENTHOUSE IN SEASIDE VILLAGE. ENJOY DIRECT OCEAN VIEWS FROM THE MAIN TERRACE OFF YOUR MASTER BEDROOM, KITCHEN AND DINING AREAS. ENJOY GORGEOUS SUNSET VIEWS FROM YOUR SECOND OVERSIZED TERRACE RIGHT OFF THE LIVING ROOM. A TRULY UNFORGETTABLE PLACE WITHIN A ONE OF A KIND PRIVATE ISLAND RESORT ALL WHILE YOU'RE LOCATED IN THE HEART OF MIAMI. THIS IS ONE OF VERY FEW FULL 3 BED, 3 BATH UNITS IN ALL OF SEASIDE. COMPLETELY REMODELED, THIS RESIDENCE OFFERS DESIGNER FINISHES AND FURNISHINGS THROUGHOUT, INCLUDING CUSTOM CLOSETS. HIGH END KITCHEN. FLAT SCREEN TV'S IN EACH BEDROOM. WALKING DISTANCE TO POOL AND BEACH CLUB, YOUR TROPICAL OASIS AWAITS. EXPERIENCE FISHER ISLAND LIVING IN THIS GORGEOUS SEASIDE VILLAGE UNIT THAT HAS BEEN COMPLETELY RENOVATED. FEATURES INCLUDE: 3 BEDROOMS, 2 BATHS, 1,875 SQ FT INTERIOR, WOOD FLOORS THROUGHOUT, TOP OF THE LINE KITCHEN & BATHROOMS, EXPANSIVE TERRACES PERFECT FOR ENTERTAINING, BUILT INS, WALK-IN CLOSETS AND BEAUTIFULLY DESIGNED AND DECORATED. DON'T MISS THIS EXCEPTIONAL RENTAL. ALSO AVAILABLE FOR SALE ASKING $1.850 M. EASY TO SHOW! LOWEST PRICED 4 BED ON FISHER ISLAND! A superb 4 / 4 bathroom fully renovated condo that shows like a luxurious home in the sky. Enjoy panoramic city, ocean, and bay views from the bedrooms, the kitchen, the living room, and terraces. Impact sliding glass doors & windows were installed during the $1M+ total renovation. This stunning unit features high-end Wolf and SubZero appliances, recessed lighting, private entrance, and four large terraces. The unit comes with 2 garage parking spaces, 2 golf cart spaces, and storage unit. Fisher Island: 216 acres of private community with private beach with beach club, tennis, golf, and 7 restaurants. Exceptional security accessible by ferry & boat.No Equity Membership Purchase Required. Unit is also for sale for $3,500,000. WELCOME TO BAYSIDE AT FISHER ISLAND. DESIRABLE 22 BUILDING. A RARE RENTAL OPPORTUNITY AWAITS YOU. ONE OF ONLY VERY FEW FULLY REMODELED 2,858sqf BAYSIDE UNITS AVAILABLE FOR SEASONAL OR ANNUAL RENTAL. 4 BEDROOMS/3.5 BATHROOMS WITH MULTIPLE TERRACES OVERLOOKING THE OCEAN AND BAY. WE INVITE YOU TO EXPERIENCE A TRULY UNIQUE LIFESTYLE ONLY AVAILABLE ON THIS PRIVATE ISLAND RETREAT. WELCOME TO BAYSIDE AT FISHER ISLAND. A RARE RENTAL OPPORTUNITY AWAITS YOU. ONE OF ONLY VERY FEW FULLY REMODELED 2,858sqf BAYSIDE UNITS AVAILABLE FOR SEASONAL OR ANNUAL RENTAL. 4 BEDROOMS/3.5 BATHROOMS WITH MULTIPLE TERRACES OVERLOOKING THE OCEAN AND BAY. WE INVITE YOU TO EXPERIENCE A TRULY UNIQUE LIFESTYLE ONLY AVAILABLE ON THIS PRIVATE ISLAND RETREAT. WELCOME TO SEASIDE AT FISHER ISLAND. A RARE RENTAL OPPORTUNITY AWAITS YOU. ONE OF ONLY FOUR FLOW THROUGH LOWER PENTHOUSES IN ALL OF SEASIDE WITH EXPANSIVE TERRACES AND VIEWS SECOND TO NONE. UNIT HAS BEEN UPDATED AND BOASTS 4 BEDROOM, 3 BATHROOMS. THIS UNIT FEATURES TWO LARGE TERRACES OVERLOOKING THE ATLANTIC, BEACH CLUB, AND GOLF COURSE. YOUR TROPICAL OASIS AWAITS!